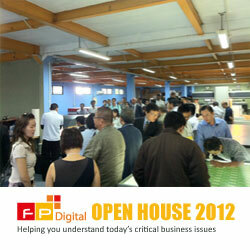 Flexo Plate Digital OPEN HOUSE 2012 a Success! In order to mark the launch of Southeast Asia’s first Flat-Top-Dot technology, Flexo Plate Digital hosted its first ever Open House in April 17, 2012 – and the day was a massive success. As part of the event, with the generous support of flexographic partners across the industry, Flexo Plate Digital was able to share the latest trends in packaging, specifically within flexographic technologies for the printing industry. Over 50 attendees and more than 18 exhibitor representatives from Kodak, DuPont, Siegwerk, and Gallus spent a lively six hours together exploring how to improve packaging industry with flexo printing technology. Everyone enjoyed the opportunity to speak directly with suppliers about each of the products and learn about the latest technologies available for the brand owners and packaging converters. Flexo Plate Digital also provided opportunity to get hands-on training with some of the machinery as well as live demonstration on Kodak Flexcel NX Wide to show off the new and breakthrough technology in flexo printing. “The recent expansion at Flexo Plate Digital was a great reason for us to put on our first Open House and judging by the positive feedback from everyone who was involved, it won't be our last event” according Eric Oh, CEO of Flexo Plate Digital. "The Flexo Plate Digital Open House 2012 gave us the opportunity to meet with potential customers in a more intimate environment than other exhibitions. We were able to talk one on one about our products and services in relaxed and positive atmosphere and instill confidence in our new customers who are not familiar with our company. The www.flexoplatedigital.com/download/openhouse2012/ will remain available as a resource. It provides links to the various products and services that were represented at the event as well as copies of presentations by Kodak, DuPont, Siegwerk, and Gallus. Ideas and suggestions for Flexo Plate Digital’s next Open House should be sent to info@flexoplatedigital.com.